As Russia prepares to elect Vladimir Putin for a fourth term as president on 18 March, the BBC's Gabriel Gatehouse looks back at a revealing event that took place at the start of his Kremlin career - when he was Russia's acting president, running in his first presidential election. 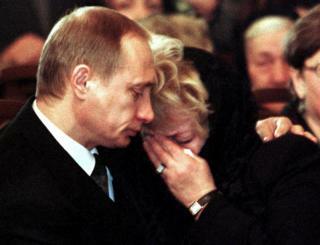 Russians rarely see their president cry, though there has been plenty of tragedy during his 18 years in power. It happened once, right at the start of his rule - on 24 February 2000, at the funeral of Anatoly Sobchak. Sobchak was one of the men who, alongside Gorbachev and Yeltsin, helped bring about the end of the Soviet Union. He was also the reformer who plucked a middle-ranking KGB officer by the name of Vladimir Putin from obscurity and gave him his first job in politics. No-one really knows what drove him to make that fateful decision. But today, factions from the old Soviet security establishment have taken hold of the levers of power in Russia to such an extent as to make it a democracy hardly worth the name. There are eight candidates running in this latest election, but Putin is known as the "main candidate", and the outcome is not in any doubt. One rival candidate calls it a "fake election". "Just like in a casino," she told me, "where the house always wins, in Russian democracy, the win is always on Putin's side." Her name - wait for it - is Ksenia Sobchak, and she is the daughter of Anatoly, Putin's old friend and mentor. Ksenia, as she is often known, is 36 years old, a former reality TV presenter-turned-opposition-journalist. Supporters of Alexei Navalny, the quote-unquote "real" opposition candidate, who's been barred from standing, say she is a Kremlin stooge - an old family friend drafted in by Putin to lend the election an air of credibility. Certainly, she would not be running without the tacit permission of the authorities. That's how Russian democracy works. Image caption An election billboard: "For Sobchak. For truth. For freedom." But the men in grey suits who run the Kremlin may be regretting their decision. Ksenia is touring TV studios naming corrupt cronies around Putin and calling the annexation of Crimea illegal. If, as she maintains, she is running not to win but to be heard, then she is certainly breaking some taboos. Let's leave the daughter for a moment and go back to the father. He was mayor of St Petersburg. Putin was his deputy. The two were so close that when Sobchak senior was accused of corruption, Putin helped spirit him out of the country on a specially chartered aeroplane. That was in the 1990s. Remember those days? Russia was in chaos. Its president, Boris Yeltsin, was frequently drunk and barely functioning. The men in grey suits in the Kremlin thought they'd found just the solution - another grey man, a blank slate, from which to build the ideal antidote to Yeltsin. They began grooming Putin as his successor. Then, suddenly, just as Putin was running for president for the first time, his old friend Anatoly Sobchak died, at the age of 62, in a hotel room in Kaliningrad. The autopsy said it was cardiac arrest but can't find any trace of a heart attack. Sobchak's widow suspected foul play and had her own autopsy done. Her name is Lyudmila Narusova. I met her recently and asked her if she thought her husband had been murdered. She paused long enough to say "Yes" 10 times over, and then replied: "I don't know." Putin really is distraught. His eyes are red, he seems to struggle to swallow as he embraces Lyudmila Narusova. Putin is not an actor. Nor is he prone to public displays of emotion. So it's reasonable to assume that he is struggling with some genuine grief. Or is it something else. Guilt? "There were people who were manoeuvring Putin into power," Narusova told me. She's right. Back then, Putin was a vehicle to power for various factions inside the Kremlin. To some extent he still is. If Sobchak was murdered, was it by one of those factions who feared his mentor's hold over him? Maybe. And if so, did the old KGB officer realise his old friend died in the furtherance of Project Putin. It's only a suspicion, but I'm beginning to think so. I asked Narusova about that autopsy she had done. It turns out she never made the results public, but keeps the documents locked in a safe in a secret location outside Russia. When I asked her why, she didn't want to talk about it. I pressed her. I said, "It sounds like you've got yourself some kind of insurance policy." "You could see it that way," she responded. "Are you afraid," I asked, "for your own safety or that of your daughter?" "You know," she said, "to live in this country is scary. Especially for those who hold opposition views. So yes, I am afraid. I am…"